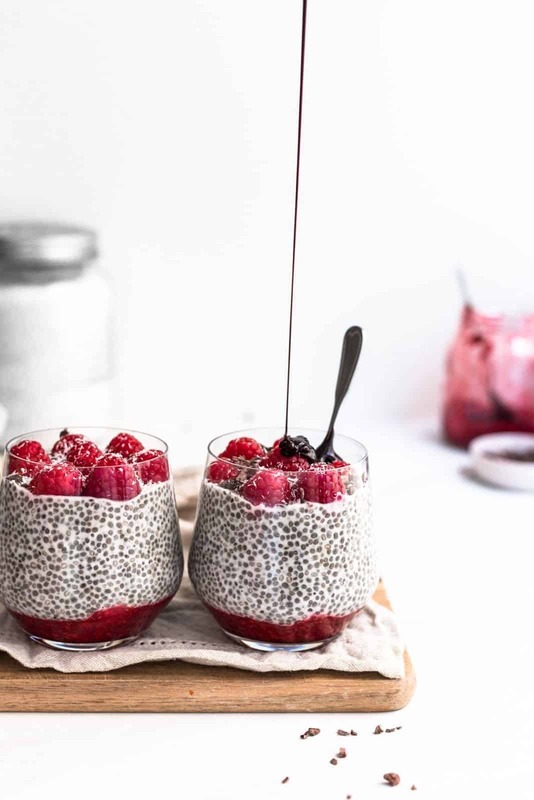 This chia pudding with raspberry jam is a fantastic breakfast option! It’s easy, refreshing and protein-packed. The next time someone asks you where you get your protein from, just link them to my page, thank you. Fun fact: I’ve been avoiding chia pudding for super long. I attempted making it before and never liked the final outcome. Despite it seeming like an obvious choice for me, I refused to get on the whole chia pudding bandwagon. Why an obvious choice? 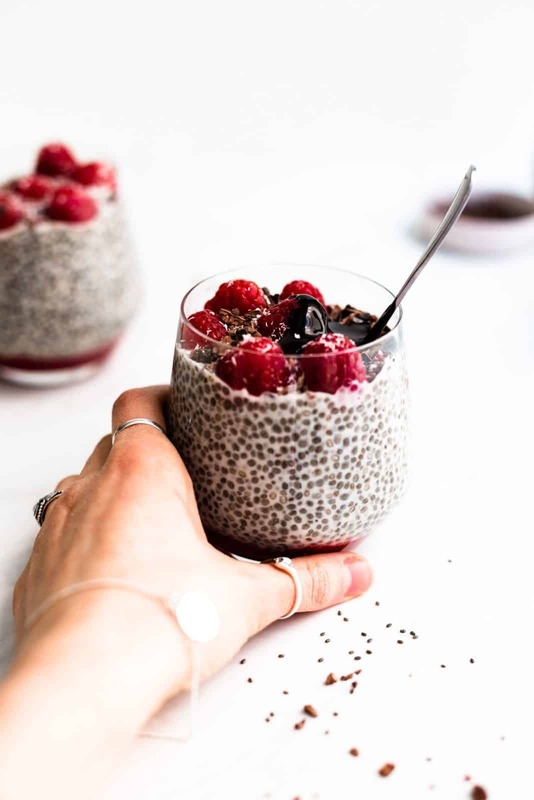 I love chia seeds and I always eat breakfast, but I don’t want to spend more than 3 minutes making it, so chia pudding seemed like a no-brainer. Still, I refused to give it a go. And guess what? I don’t regret it, because my recent discovery of chia pudding actually allows me to be in that initial lovey-dovey phase with it right now. I’m not yet sick of it which can be the case with breakfasts you’ve been having day in day out for a few months – yes, I’m looking at your porridge. 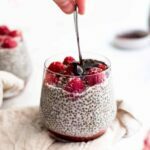 Chia pudding is super duper healthy. I know, what a shocker, right? In my recent matcha ice cream post I rambled on about how I hate health claims that aren’t actually backed up by anything. Instead of just calling it a superfood, I want to have my facts right in front of me and know how it influences my overall health. So – what makes chia seeds so healthy? they are packed with nutrients but are very, very low in calories which isn’t necessarily for everyone, but great for those trying to lose weight. Chia seeds are a little bit like tofu. They have virtually no flavour and can form a fantastic base for so many meals. They take on the flavour of other ingredients in your dish, so it’s important to always balance them out with something that really packs a punch. When making this chia pudding, I opted for a combination of unsweetened almond milk and maple syrup. There’s plenty of other combinations you could try out, but this provides a great base for this delicious breakfast option. 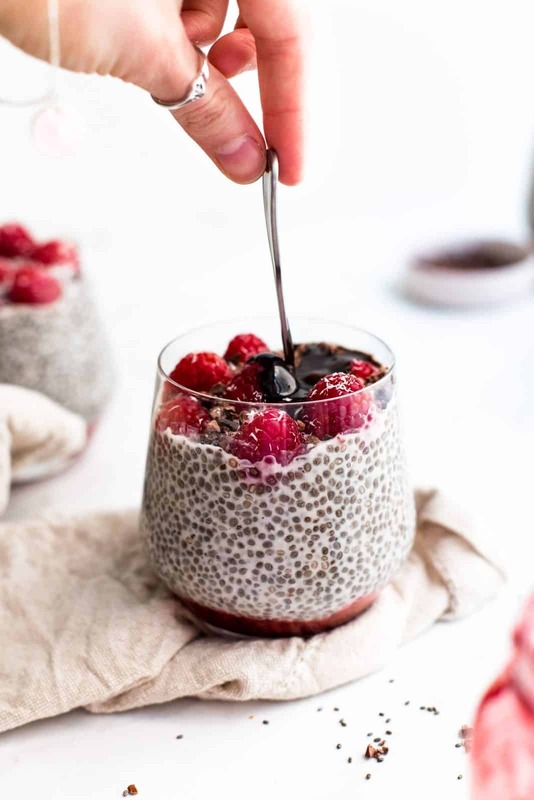 You might want to think twice about making chia pudding and toppping it off with some fresh fruit only. To make sure your new breakfast is actually full of flavour, you will need to add another layer. This is where raspberry jam comes into play – it’s flavourful, refreshing and healthy. 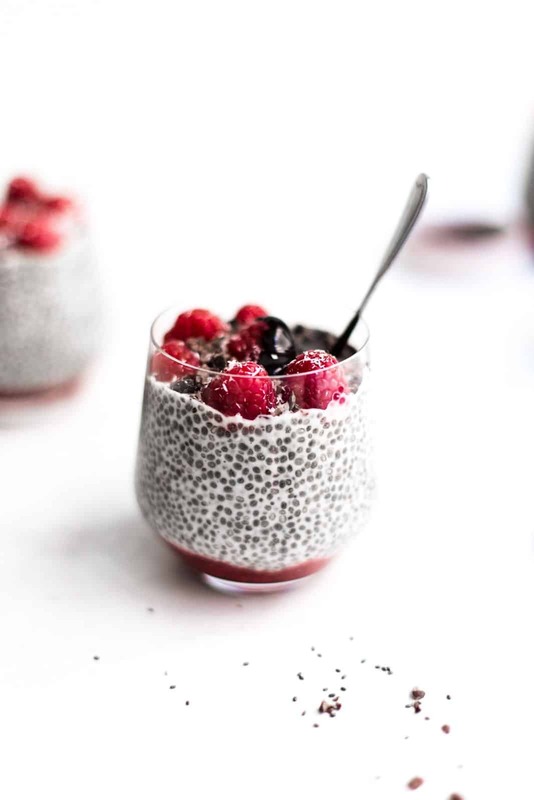 You can make it simply by mashing up some raspberries, adding a few spoons of chia seeds and a drizzle of vanilla essence. Leave it in the fridge overnight and voila, you’re a jam master! I like to make sure my chia pudding has a crunchy side to it. I added cocoa nibs, but you could opt for coconut and almond shavings or other nuts. I topped it off with a generous drizzle of melted chocolate – you could also use maple syrup or other sweetener you might have at home. As you’ve probably gathered by now, this vegan chia pudding is highly customisable. Most of all, it’s incredibly easily. When kept in an airtight container, you can keep it in your fridge for several days. Hello, extra 3 minutes of sleep – you can now just roll out of bed and head straight for the fridge! Add 10 tablespoons of chia seeds to 3 cups of milk. Add maple syrup and stir very well. Refrigerate overnight in an airtight container. To make the raspberry jam, mash up fresh or frozen raspberries with a fork. Add chia seeds and vanilla essence. Refrigerate overnight in an airtight container. 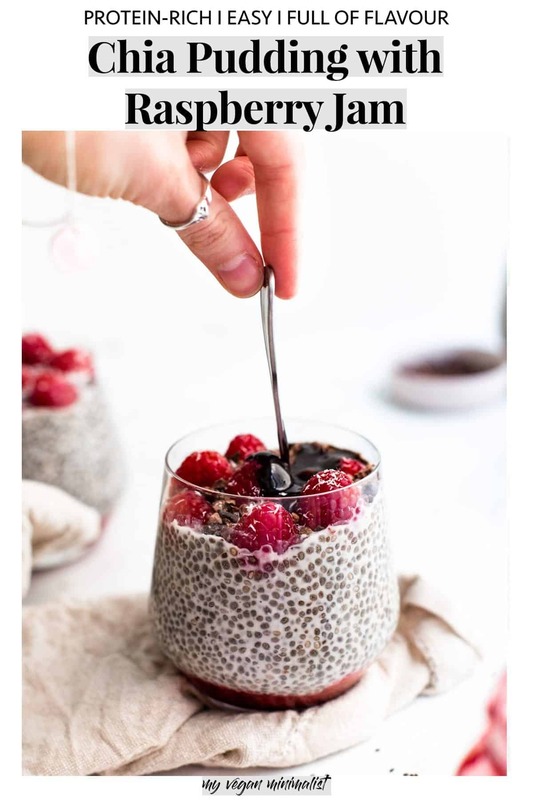 Create alternating layers of chia pudding and raspberry jam (or simply split them into just 2 layers like I did on the picture). Garnish with fresh raspberries, cocoa nibs, coconut shavings and a drizzle of sweetener or melted dark chocolate.